A late penalty from Jamal Rashed broke India’s hearts as Bahrain entered the Round of 16 of the AFC Asian Cup with a 1-0 win in their final Group A game at the Sharjah Stadium on Monday. In a nervous start for the Blue Tigers, Anas succumbed to injury in the opening minutes and was replaced by Salam Ranjan Singh. Gurpreet Singh Sandhu’s goal was threatened and he was called into action as early as the 5th minute when he pulled off an uncanny save off Komail’s shot from outside the box. Despite losing defender Anas Edathodika – who was replaced by Salam Singh – to an injury in the third minute, Indian defensive play frustrated the Bahrainis who began playing a few wayward passes in the middle of the park. Then in the 26th minute, India showed they were not afraid of playing with a high defensive line as Halicharan Narzary’s strength allowed him to take on two Bahraini defenders and Sunil Chhetri soon found himself in a promising position inside the Bahraini box, but a poor first touch left the Indian talisman scratching his head. Bahrain had the first shot on target when poor defensive play gave Komail Hasan Al Aswad space on the edge of the box in the fourth minute. But the midfielder’s effort was punched away by Indian goalkeeper Gurpreet Singh Sandhu with the ball falling on the feet of Jamal Rashed whose shot missed the target. Bahrain continued to put pressure on India and almost immediately Sayed Dhiya Saeed hit an ambitious long-distance shot that failed to trouble Sandhu. Despite the relentless Bahraini pressure in the early stages of the first half, India showed they could build moves of their own as some delightful work on the left flank from Ashique Kuruniyan gave them a hint of a chance in the 14th minute, but the Bahraini backline rose to the challenge. Though Bahrain penetrated into the Indian box, the opponents did not create any serious trouble that Sandesh and his line could not deal with. Even skipper Pronay Halder made a goalline clearance in the dying embers of the first half to keep Bahrain at bay. Coach Constantine added more spark in the attack with the introduction of Jeje Lalpekhlua at the half-way point, replacing Ashique Kuruniyan. But it still was the defensive performances of Pronay Halder and Sandesh Jhingan that provided the forwards cover and thwarted the opposition attacks. While the passionate Indian fans never stopped cheering for their team, it’s their backline that put a smile on Stephen Constantine face in the dugout. Bahrain soon regained control of the midfield, but their attacking play in the final third lacked bite and it was India that went into dressing room with their heads held high. India began the second half with striker Jeje in place of Kuruniyan. But it was Bahrain that continued to look for a goal as Al Aswad’s long-distance shot flew over the crossbar in the 60th minute. 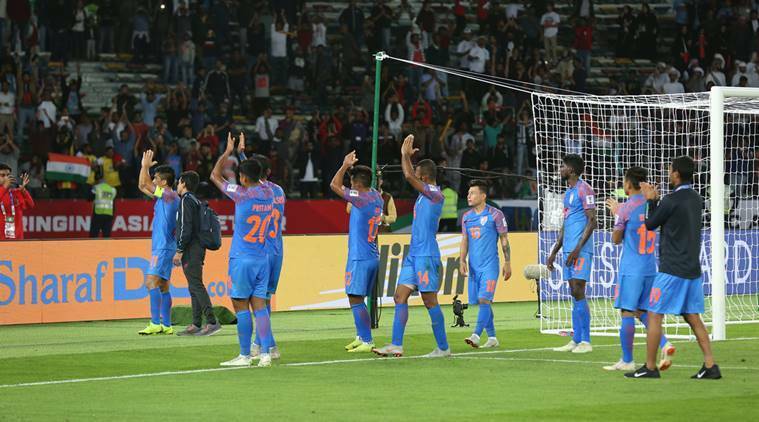 India’s resilience, though, kept troubling Bahrain as the impressive Udanta Singh’s darting run earned India a freekick only for Chhetri to waste it with a poor effort in the 63rd minute. Udanta was in the thick of the action three minutes later with a superb tackle inside his own box to deny the Bahrainis a scoring chance. But Bahrain had their best chance in the 73rd minute when chaotic play by the Indian backline saw Sandhu collect a back pass from an Indian defender. Bahrain missed the freekick from inside India’s box, thanks to Sandhu who made up for his mistake with a heroic save. India defended as though they were playing for their lives, but the relentless pressure from Bahrain in the dying minutes saw captain Pronay Halder make a poor challenge on Hamad Mahmood inside the box. Jamal Rashed scored from the spot in the dying embers of the game to hand Bahrain a last gasp win after Pronay Halder brought Hamad Al Shamsan down in the box. Throughout the match, India were on the backfoot. With Bahrain having the lion’s share of possession, the Blue Tigers defended with their lives, with Sandesh Jhingan marshalling the backline. The Indian midfield, compact, came back to help the backline, hence allowing Bahrain shots from distance. Throughout the 90 minutes, India defended doggedly before conceding. INDIA: Gurpreet Singh Sandhu (GK); Pritam Kotal, Anas Edathodika (4’ – Salam Ranjan Singh), Sandesh Jhingan, Subhasish Bose; Udanta Singh, Pronay Halder (C), Rowllin Borges, Halicharan Narzary (79’ – Anirudh Thapa), Ashique Kuruniyan (45’ – Jeje Lalpekhlua), Sunil Chhetri.